Models for Muliadi’s paintings include religion professor Sam Thomas (at left as a giant), the children of art professor Michael Pearce, and classmate Allison Rapp ’14. In his first painting as a studio art student, Harold Muliadi ’14 depicted Santa Claus in the style of a Greek Orthodox icon. As quick as you can say Saint Nick, his teacher Michael Pearce saw that Muliadi had his own sack of artistic gifts and the generosity of spirit to share them. “He was such a cool student and such a natural,” said Pearce, an associate professor of art and curator of Cal Lutheran’s Kwan Fong Gallery of Fine Art. Muliadi’s first solo show, What If: Life in a Handful or Less, opened on Nov. 14 at the gallery and runs through Jan. 2. The exhibit is described as a meditation on Francisco Goya’s 19th-century masterpiece The Colossus, where a brutish giant lumbers through the countryside, sending Lilliputian humans and livestock running for their lives. Muliadi’s oil paintings steer clear of horror and instead play slyly with human scale in modern settings. Think of a miniature woman descending a staircase of crayons, or a giant in a trench coat spying on tiny people conversing in an LAX parking garage. 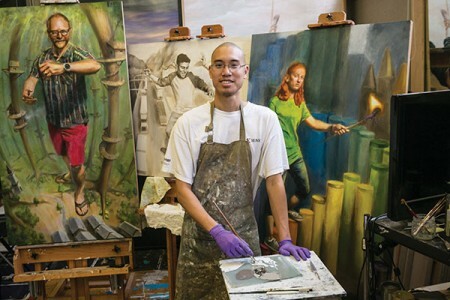 Before transferring as a junior from Moorpark College, where he’d earned his associate’s degree in anthropology, the Cal Lutheran Class of 2014 valedictorian, now 24, had no formal art training. He never considered the life of a working artist until he took an art history class his final semester at the community college. “That’s what turned me to the dark side of art,” Muliadi said, chuckling and pressing his index finger to his lips. “Riding in the back seat, I would look at the other cars and thought what it would be like if they were picked up and moved elsewhere. What if you could freeze time and explore it?” Muliadi said. His painting Playing on the 405 offers an imaginative answer to that question. He scouted programs at four-year universities and selected Cal Lutheran because of its atelier approach, where each professor has a studio and creates alongside students. Except, the energetic Muliadi doesn’t always work alongside his instructors, Pearce said. Muliadi admits strolling or pacing helps him break through creative roadblocks. The walks must work. Pearce has seen few students develop a unique style as quickly as Muliadi has. “It is as if he is illustrating a strange adult storybook, but no one has written the literature,” Pearce said. Muliadi clearly has an artist’s eye, said Sam Thomas, an associate professor of religion and the model for a gentle giant in another of Muliadi’s works. “He has discovered a way to express the things he perceives about the world and insights that don’t come out of language,” Thomas said. The artist spent much of his summer this year at the painting studio in K Building, preparing for his show while working as Pearce’s assistant and helping out in his family’s design business. Now he plans to pursue a master’s degree and become an art instructor. He hopes visitors to his Kwan Fong exhibit take away the life-affirming power of imagination. “There is a lot of enchantment to be found in every moment we are alive,” he said.